Growing up without siblings does not mean a child will have poor social skills later in life, researchers say. A US study of more than 13,000 11- to 18-year-olds found "only-children" were chosen as school friends just as often as peers who had brothers and sisters. An earlier study by the Ohio State University team had found poorer social skills in only children at nursery. 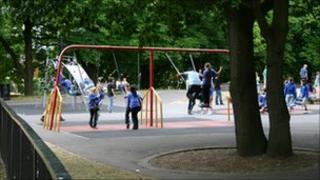 But they found that children "catch up" during their school life with peers who have siblings. The sociology researchers used data from the National Study of Adolescent Health, for which students at more than 100 schools were interviewed during the 1994-95 academic year. Each student was given a roster of all students at their school, and asked to identify up to five male and five female friends, allowing the researchers to see how popular a student was by counting how many times peers identified him or her as a friend. Overall, students in the study were nominated by an average of five other schoolmates as a friend. There were no significant differences in that number between those who had siblings, and those who had none. The number of siblings a teen had or did not have did not appear to affect popularity. Socio-economic status, parents' age, race, and whether an adolescent lived with both biological parents or not affected results. Donna Bobbitt-Zeher, co-author of the study and assistant professor of sociology at Ohio State University, said: "As family sizes get smaller in industrialised countries, there is concern about what it might mean for society as more children grow up without brothers and sisters. "The fear is that they may be losing something by not learning social skills through interacting with siblings. "I don't think anyone has to be concerned that if you don't have siblings you won't learn the social skills you need to get along with other students in high school. "Anyone who didn't have that peer interaction at home with siblings gets a lot of opportunities to develop social skills as they go through school." The research is being presented to the American Sociological Association's annual meeting.